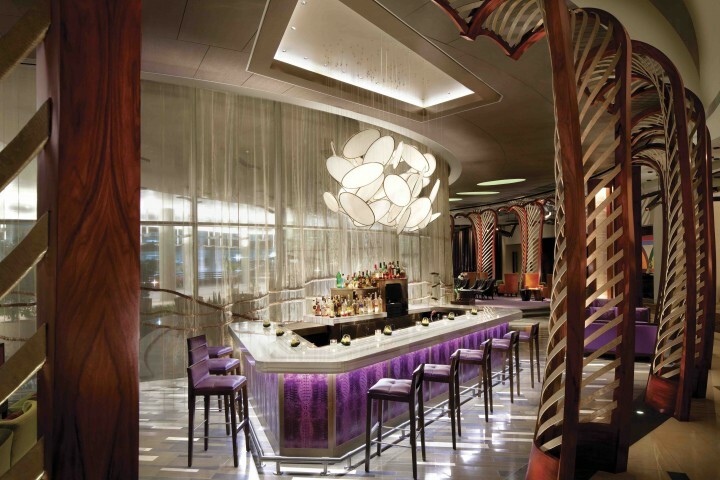 The lobby lounge at the Vdara Hotel & Spa in Las Vegas is a bar with two faces: the luxury cocktail den Vice and the more approachable Versa, which serves light and refreshing drinks. The boutique, non-gaming property Vdara Hotel & Spa aims to highlight a different side of Sin City at its new lobby lounge Vice Versa, which debuted in February. The venue has two components: Vice, which offers extravagant cocktails, indulgent hors d’oeuvres, and lesser-known beers and wines, and Versa, a lighter counterpart with refreshing mixed drinks, more approachable fare, and popular beer and wine labels. The dual-personality bar has indoor and outdoor seating, providing a casual vibe during the day and transforming into a contemporary high-energy lounge at night. Cocktails at Vice include the Rosés Are Red, made with Nolet’s Silver gin, Giffard Lichi-Li liqueur, fresh raspberry and sage, topped with Mumm Napa Brut Rosé sparkling wine, and the V Espresso Martini, comprising Ketel One vodka, St. George Nola Coffee liqueur and fresh-brewed espresso. Meanwhile, Versa offers the Berry Blossom, a blend of Hangar One Raspberry vodka, Luxardo Maraschino liqueur, fresh lemon and white cranberry juice, and the Fashionably Late, mixing Angel’s Envy Port Cask–Finished Bourbon, Lustau Solera Oloroso Sherry and salted brown sugar syrup (cocktails at both concepts are $14). The venues also serve food, ranging from surf and turf sliders and lobster tacos at Vice to pan-seared ahi tuna and grilled lamb lollipops at Versa ($8 to $18). 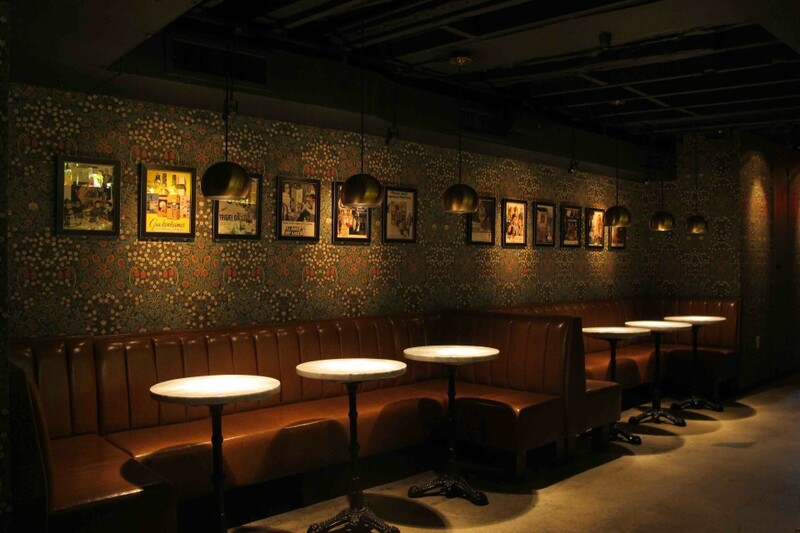 The Up & Up opened in Manhattan’s Greenwich Village in February with a serious drinks menu and a relaxed atmosphere. The cocktail bar, from bicoastal restaurateur and bartender Matthew Piacentini, features an extensive drinks menu of signature selections ($14), bottled and draft cocktails ($45 a 375-ml. serving; $90 a 750-ml. serving), and specialty shots ($8). Standouts include the Strunk Text, comprising Cabeza Silver Tequila, Amaro dell’Erborista, pink peppercorn, chanterelle mushroom, lime juice and celery shrub, and the Jenny Kidd, a blend of Barr Hill gin, St-Germain elderflower liqueur, Campari aperitif and lemon juice. The venue also offers bottled beers ($5 to $10) and wines by the glass ($12 to $19), along with small bites like tuna pâté and chicken liver mousse ($8 to $12). Boasting 48 draft lines and an extensive selection of whiskies and bottled brews, Tapworks Tavern & Grill opened in February in Chicago’s Greektown neighborhood. The venue boasts two separate bars and offers spiked milkshakes and beer-infused food, including fish and chips, burgers, and cheese dip. Chicago-based Bottleneck Management opened a location of its Old Town Pour House brand in Gaithersburg, Maryland, this March. The tavern has more than 90 local and global brews on draft and offers specialty cocktails and wines on tap, as well as a menu of reinvented classic American fare like filet mignon sliders and crab cakes. Wine rules at Augustine, an approachable bar with an upscale menu that opened in February in Los Angeles’ Sherman Oaks neighborhood. The venue offers more than 75 glass pours, including high-end labels like Château Latour, as well as a variety of craft beers on tap poured behind a marble bar. Inspired by the cafeteria and canteen culture of the 1940s, Mess Hall debuted in February in Manhattan’s Harlem neighborhood. The cozy bar specializes in craft beers and Bourbons and also offers seasonal cocktails, house-infused vodkas and bar snacks.